The URSA Mini Pro and other new equipment – Interceptor Inc. 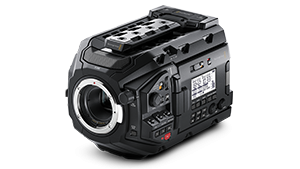 The URSA Mini Pro, a digital cinema camera capable of shooting up to 4.6 K CinemaDNG. The specs are basically the same as the URSA Mini with the same sensor. A new intuitive feature of the camera is the ability to change the camera to the ability to change the aperture on an EF lenses using a dedicated dial instead of We will stock the new PL lens mount, please contact us if you wish to use other lens mounts. The new ATEM Television Studio HD comes with 4 SDI and 4 HDMI inputs with built-in 2D DVE. The switcher can now be operated directly with the new buttons on the front panel. The new HyperDeck Studio Mini can record up to 4K30p ProRes on SDXC. It is also possible to upload files using FTP. Due to their convenient size, it is possible to fit both ATEM Television Studio HD and the HyperDeck Studio Mini into 1U rack mount. Using the ATEM software, you are able to control the HyperDeck as well. During a studio shoot, the camera feed can be recorded onto the HyperDeck. This playback feature on the HyperDeck can be used as a reference for shots that require compositing. 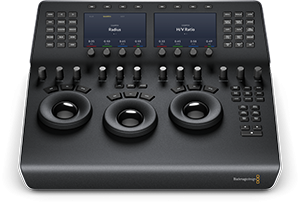 The two new DaVinci Resolve control panels. The Mini Panel has two LCD screens, color wheels and knobs making most operation possible solely with the panel. Barely having to use your keyboard or mouse, allows you to fully concentrate on the color grading. you have any questions, please don ‘t have any questions, please contact us if you have any questions, please contact us . If connected to ATEM and URSA Mini, T hesitate to contact us.